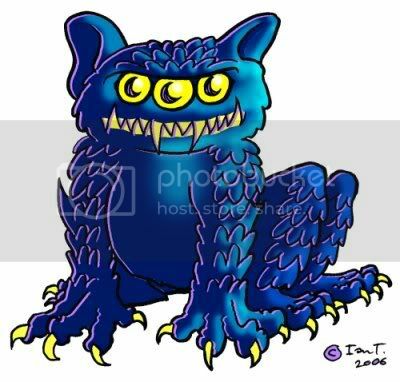 This isn't a generic three-eyed monster. It's a cartoony portrayal of my impression of an Ezwal, from AE Van Vogt's scifi novel, The War Against the Rull. I originally read the first part of this book in a compilation of stories from Astounding science-fiction magazine (where Jamieson, the human hero is stranded with an ezwal on a strange planet). The compiled book collects together five parts, but I prefer the original ending to the first part, where the Ezwal gets the last line. Originally, for this subject I thought about drawing some traditional big beast that preys on people, along with a commentary about David Quammen's fascinating book, The Monster of God. The book deals with the few remaining big predators and how they barely manage to survive, in perilous co-existence with humanity. In either case the "Monster" is a large scary beast, but only monstrous by perception. this is a cool illo - love the fangs! This is a great rendering of a really scary looking beast! Looks great to me Ian! Sorry I've missed out on commenting on your stuff over the last couple of weeks - I enjoy your posts thoroughly! i love its color not the usual green we see....and those fangs are great ian! i hope you still have plan to post that commentary about Monster of God. Hey dude! So glad you posted. That's a V COOL 3 eyes monster!! I love his scalely skin! Very cool. I love the eyes and the fangs. Guess what, Ian? I heeded your advice!!! What can you say to my colored monster version? DFarn good for a quick job...it looks quite polished, actually! I love the sharpness of the teeth and the claws and the confusion the three eyes evoke. I can imahine that your cardboard version must have been fabulous! I am always impressed by your sources...I oftendon't know what they are, so I'm interested when you give the backgraound and explain.